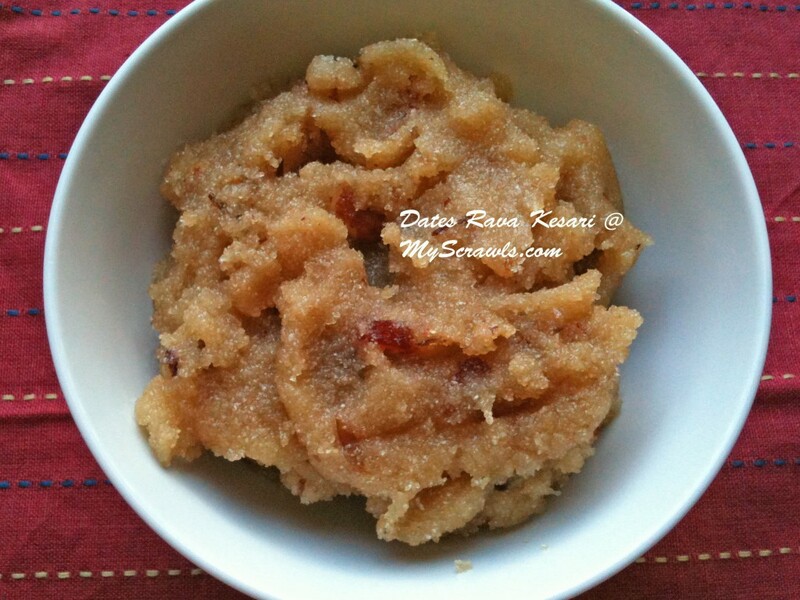 Rava kesari is an easiest sweet recipe that can be made in a jiffy! Some dont roast the rava before making kesari. But I prefer roasting rava in ghee until it turns brownish in color and leaves out a sweet aroma! I have not used kesari powder/orange color in this recipe. I prefer to the have the golden brown color of the roasted rava itself. I like to have a jam like consistency for the kesari. You can even add 2 cups of water for a loose consistency. Use non-stick pan for easy stirring. Heat a tbsp of ghee in a pan. Roast cashews and dates till it turns slightly brown in color. Allow it cool and keep it aside. Heat a tbsp of ghee and roast rava till it turns golden brown in color. Add water in the pan and allow it to boil. Now add sugar, kesari powder and cardamom powder. Once the sugar dissolves, add roasted rava. This should be done slowly with continuous stirring so as to avoid forming lumps. Close the pan and allow the rava to cook for a few minutes. Once kesari starts thickening, add the remaining ghee and keep on stirring for few minutes until the rava gets cooked completely. Remove it from the stove top and garnish with the roasted cashews and dates. If the rava is already brownish,Kesari Powder-is it not redundent? All I know is spare the ghee and spoil the Kesari.Prefer thebig granules rave to the nice one! The algorithm of preparation is thorough! Hope when sometime you are here I geta chance to taste it ! What has skandhu to say about it? May be he prefers this for breakfast!! That is what I guessed about Skandhu! Thanks for the offer! May be that too works! Yummy kesari.. looks perfect ! !